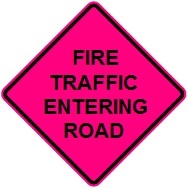 Fire Traffic Entering Road reflective Fluorescent Pink Roll-up with heavy-duty fiberglass rib supports and anti-kiting Velcro strap. Used to warn motorists that emergency traffic is entering and exiting at the intersection. Sign use requires approval by state Department of Transportation if placed on a state road.